"The Danville-Boyle County Chamber of Commerce exists to advance the prosperity and well-being of the business community, particularly its members, with a goal of improving the quality of life in this community." Someone by the name of Mike is calling Chamber members saying he is doing a survey, under the guise of working with your Chamber and using my name, to get personal information about your business. We are NOT doing any PHONE surveys of the membership, at this time. We ARE doing an email survey about proposed tax increases. We would like your responses to this three question survey, if you haven't already done so, to get our members input on this issue that directly affects you. Two significant increases are proposed to both payroll and net profits taxes to fund projects in this year's city budget. Please take one minute to give us your input - no later than Friday noon, June 2. Go to here to participate. Our third fundraiser is our annual Golf Tournament. Please consider bringing a team and joining us! The meeting will be held at the Boyle County Fire Headquarters, located at 1500 Lebanon Road, and will begin at 8:30 a.m. SEE DETAILS BELOW. 3 p.m., with a special program at 11 a.m. The Great American Brass Band Festival is here! For a list of all the activities you don't want to miss go to here . Music of the Roaring Twenties will be center stage at the 28th annual Great America Brass Band Festival, this weekend, June 1-4, 2017. SEE BELOW FOR DETAILS. Robel Abate will help our Workforce Development committee put all Boyle County resources into the Bluegrass/Heart of KY United Way 211 database. If you are an agency that offers services in our County, please make sure you share them with Robel. His email is robel.abate@centre.edu. Haley Varnadoe will work on Member Highlights. Please see a write up on her below. The 2018 Danville Livability Magazine planning is underway. Rhys Simmons with Livability Media will be contacting you about sales opportunities - both in the magazine and digitally - over the next few weeks. He started yesterday. I hope you will schedule a time to see him and learn of the many new offerings to help promote both your business and the community through our annual publication. The magazine looks at our community through articles and photography showcasing our quality of life and economic development opportunities. 5000 magazines are printed annually and used by numerous organizations, including the chamber, tourism, Main Street programs, economic development office, city and county governments, real estate offices, the hospital, etc. to promote the region. Chamber members are promoted and included in two directories (alphabetically and categorically) in the back section, as well. We hope you will consider advertising in this unique publication that promotes our communities. Make plans to come out to the festival this weekend. Tye Financial Group Business After Hours - Friday, June 9, 4-6 p.m.
Join us at Tye Financial Group on Friday, June 9th Business After Hours, from 4-6 p.m. Kleckner's BBQ will be the featured food and this is a Pot of Gold event, now worth $300 for a lucky member who is present when their name is drawn. Stop by, visit Tom, Regena and Dawn, meet the artists, network your business and have some great food! PLEASE NOTE THE CHANGE IN DAY, WEEK AND TIME! We are collaborating with The Arts Commission of Danville-Boyle County's Gallery Hop, and the opening of Pioneer Playhouse to give you three events for one evening! The Business After Hours, located at Tye Financial Group, located at 141 N. Third Street, is from 4-6 p.m. They will also serve as a Gallery Hop stop during the Gallery Hop from 5:30-8 p.m. For a complete list of Hop Stops, pick up a map at any downtown business flying the purple event flag on Friday, June 9th. June 9th is also the opening night of the Playhouse's 2017 season. A new feature to this year's Gallery Hop will be the gallery of Robert Powell at Pioneer Playhouse. The Playhouse's first show presents local playwright Liz Orndorff's popular and award winning, "Death by Darkness". You can finish your evening at the Playhouse for the play at 8:30 p.m. For show ticket information, call the Playhouse Box Office at 236-2747. Leadership Boyle County graduated 20 people from the program on May 15, 2017. Front row, left to right are: Tina Patel, LGE-KU; Jamie Malusky, BC&TC; Sarah Daniel, Coldwell Banker, VIP Realty; Cody Polston, Hampton Inn; Mandy VanHook, LGE-KU; Shelley Bigelow, Farmers National Bank; Beth Goode, Danville Independent Schools; Michelle Carter, BC &B TC; Donna Peek, City of Danville; Gail Gottshall, Fort Knox Federal Credit Union; Kara Bastin, U.S. Bank; Second Row: Brent Williams, Burkmann Nutrition; Paden Tye, Blue Moon Insurance Agency; Burt Piper, Ephraim McDowell Health; Patrick Noltemeyer, Centre College; Nick Wade, Heart of Danville; Jacob Pankey, Boyle County Fiscal Court; David Young, Boyle County Schools and Brant Welch, Farmers National Bank, Absent from the photo was Heather Pennington, DelCotto Law Group. Let us introduce you to our Centre Intern, Haley Varnadoe. She is working to get more Member Highlights completed to give our members more publicity. Please take her call when she contacts you! From Marietta, Ohio, Haley is a rising junior at Centre College majoring in Economics & Finance and minoring in French. She is a member of Centre's swim team, and when she is not in the pool, she is probably in her hammock studying for the LSAT or planning her next travel adventure. A fun fact about Haley is that she has been a vegetarian for 12 years! She is so excited to have the opportunity to get to know more about the Chamber's businesses and hopes that her work this summer can help them get more publicity. Award Sponsor - Blue Moon Insurance Agency; Eye Protection Sponsor, Danville Eye Center; Safety Station Sponsor, Wilderness Trail Distillery; Concession Sponsor, Paps Foods; Steel Sponsor, The Spine Center; Station sponsors, Bob Allen Motor Mall, Doss & Horky, State Farm Insurance - Bob Miller, Agent, Tye Financial Group; Safety Glassses, Denyo Manufacturing; Use of ATV, JVM Motorsports. Door prize sponsors were Bragg About It Guns; Infantry Arms and Surplus; Curtsingers and Sportsman's Warehouse. 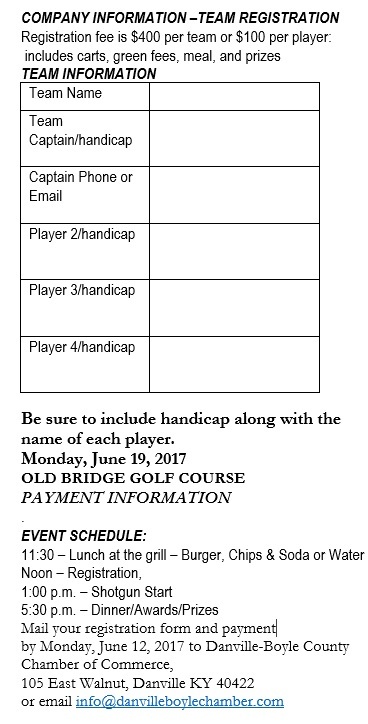 JUNE 19 GOLF TOURNAMENT - The Danville-Boyle County Chamber of Commerce Fundraising tournament is Monday, June 19, at Old Bridge Golf Course. The shot gun start is at 1 p.m. Northwestern Mutual will provide lunch and Cheddar's Scratch Kitchen will provide dinner. Mark your calendar and plan to join us. Contact Treina at info@danvilleboylechamber.com to register your team or to learn about sponsorship opportunities. Shaker Village of Pleasant Hill invites members of the public to join president and CEO Maynard Crossland, representatives from John Milner Architects and village staff for a ceremonial project launch of the Restoring the Spiritual Center project on Saturday, June 3. The largest preservation project at Shaker Village since the initial site restoration in the 1960s, Restoring the Spiritual Center will preserve, protect and interpret the site's two most iconic buildings-the 1820 Meeting House and the 1824 Centre Family Dwelling. The $5.1 million rehabilitation project is part of a multi-phase effort to revive the preservation of Shaker Village's rich cultural landscape, while equipping historic spaces for new community-centered programs and activities. The ceremonial project launch is planned for 11:30 a.m. on Saturday, June 3 on the front steps of the Centre Family Dwelling. From noon until 2 p.m., representatives from John Milner Architects will join Shaker Village history experts to host four distinct, 30-minute tours that talk about preservation in a global way and will use features from the building to address specific planned improvements. Two performances of solo Shaker Music will take place in the 1820 Meeting House at 11 a.m. and 2 p.m. Guests are invited to help "close the Meeting House and Centre Family Dwelling" at 7 p.m. that evening. Other daily tours, talks and activities will continue as planned. Mark your calendar for June 20 as the Danville-Boyle County Chamber of Commerce hosts a follow-up Community Forum on Workforce. The meeting will be to share work underway since issues were identified in a February 21 Workforce Development community forum. That meeting was to invite dozens of interested agencies and individuals to meet and discuss issues and resources in our community. As a result of facilitated small groups, a list of issues was developed and the Chamber's workforce committee prioritized those and began work on two. This meeting continues the discussion and shares the work underway on developing a pre-employment training course and the implementation of a resource list into the Bluegrass and Heart of Kentucky United Way's 211 Resource Directory. The meeting will be held at the Boyle County Fire Headquarters, located at 1500 Lebanon Road, and will begin at 8:30 a.m.
Brad Godbey, Courtney Tarvin, (both Central KY Ag Credit) Heather Hall, Caretenders, Denise Henderson,Ephraim McDowell Foundation, and Joe Goggin, Central KY Ag Credit. Caretenders offers nursing services, medication management, wound care, cardiac care, rehabilitation services, social services, home health aide, care coordination and senior advocacy. They can have an RN assessment within 24-38 hours of discharge and can provide anything from medication management to meal preparation. They will also coordinate care with private duty services including transportation and home medical equipment. They can assess elderly patients with current medical problems who may be living on their own or under supervision of a care giver. Central Kentucky Ag Credit provides lending support to farmers and rural residents in Central Kentucky. Ag Credit covers the 17counties of Central Kentucky, with seven branch locations. Ag Credit is a cooperative - customers own the association. They specialize in making farm loans and home loans. Ag Credit is your lender for any rural purpose. Welcome to our newest Member. Thank You for your INVESTMENT in your Danville-Boyle County Chamber of Commerce!! Dr. Kim Frazier has opened her own practice, One Way Gynecology, located at 126 B Daniel Drive. Staff, Chamber Ambassadors and members joined her for her ribbon cutting. One Way Gynecology is a gynecologic practice dedicated to the health and wellness of the women in Central Kentucky. Recent 2017 Membership Renewals - Thank You for your INVESTMENT in your Danville-Boyle County Chamber of Commerce!! Guarded, an Angela Correll book, will be performed at Pioneer Playhouse this summer. Women business owners and managers are invited to SAVE THE DATE to attend the dinner and play on July 13. The Chamber of Commerce and the Business Professional Women's group are co-hosting this event. Angela Correll has agreed to discuss her latest book that evening with us. Watch for details. Thanks to Encompass Financial Advising for sponsoring Chamber 101. Denyo Manufacturing Corp. held a ribbon cutting and celebration of their latest expansion. All employees were present when the ribbon was cut. Yashior-san, who is the third in command in Japan and once oversaw Denyo for six years in the early 2000s, was a speaker. Among the other speakers were Bob Grayden, President of MQ Power, and current Denyo CEO Toru Hiroi. Who goes to the movies? Click on 1Better for more details to advertise at the Danville Cinemas. Save on what you need to do business with.